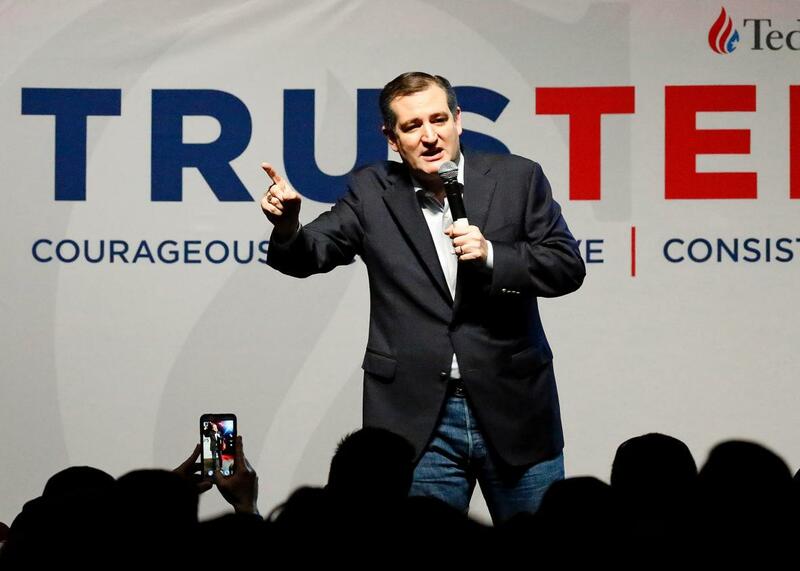 Ted Cruz's tax plan will not boost exports. No. Do not trust Ted. Thursday’s Republican presidential debate was a tad light on policy discussion. But when he wasn’t busy telling Donald Trump to take a deep, yogic breath, Ted Cruz did manage to plug his controversial tax plan by claiming it would supercharge U.S. exports. This is a pitch he’s been making for months, despite the fact that economists widely agree that it’s simply not true. And my tax plan, which is a very, very detailed plan on the website, tedcruz.org, is what’s called border-adjustable. We get rid of all the taxes. We get rid of the corporate income tax and the death tax and the Obamacare taxes and the payroll tax. And we replace it with a 16 percent business flat tax that is border-adjustable, which means all exports are entirely tax-free and all imports pay the 16 percent business flat tax. That’s a 32 percent differential. What that will do, Chris, is bring millions of manufacturing jobs back to this country, bring the steel industry back to this country, create an environment where when we compete on a fair and level playing field, American ingenuity can beat anyone. But right now, the federal government isn’t giving us a level playing field. Cruz’s “business flat tax” is what’s known to human beings around the globe as a value-added tax, or VAT. It’s essentially a national sales tax with an administrative twist: Instead of collecting it only from retailers, like the state sales taxes we all know and resent, the government levies the VAT at every stage of the economic supply chain (this makes it harder for businesses to cheat on it). The U.S. is the only major developed country that doesn’t have a VAT, and there’s a lively debate to be had about whether passing one would be a worthwhile American initiative. But nobody who seriously studies tax issues actually thinks implementing a VAT would help our exports. Not liberals. Not conservatives. Why not? Cruz describes his plan almost as if it were a tariff, penalizing imports and sparing our exports. As Citizens for Tax Justice has explained, it is no such thing. Under a system like the one Cruz has proposed, foreign companies would have indeed to pay the American VAT tax when they exported goods to our shores. But you know who else would have to pay the same exact tax? American companies selling goods to American consumers. Every business, whether they were based in Texas, Iowa, Germany, or China, would all play on the exact same playing field. American exporters would be in a similar position abroad. They would not have to pay the American VAT. But a company selling wheat in Europe, for instance, would still have to pay the French VAT in France and the Belgian VAT in Belgium. This is why world trade rules say border-adjusted VATs like Cruz’s are perfectly acceptable. If they did act like tariffs, they’d almost certainly be verboten. Some politicians, including Bill Clinton, have made a more sophisticated version of Cruz’s argument. They say that cutting the corporate income tax, which only hits American companies, and replacing it with a VAT that exempts exports—which is exactly what Cruz wants to do—would make U.S. businesses more competitive globally by allowing them to sell their goods for less overseas. But as Alan Viard of the American Enterprise Institute has written, economic theory suggests otherwise. Without a corporate income tax, the relative price of American cars and grains and diesel fuel might drop briefly. But as countries purchase more U.S. goods, exchange rates would adjust, the value of the dollar would rise, and American exporters would quickly lose their newfound edge. This is part and parcel of a larger economic point: It’s really hard for a country to change its trade balance. Basic theory says that over the very, very, very long term, imports and exports in any given country should eventually balance each other out. Obviously, in any given year, that’s not true. But in order to run a surplus for any extended period of time, a country has to actively push down the value of its currency or encourage its own citizens to save lots of money rather than spend (See: Japan and China). Same goes if you want to cut a trade deficit. But Americans like to spend, and we let our currency float freely. Nothing Cruz has suggested would change that.